Increasing amounts of litter end up in the world’s oceans. This marine pollution represents a rather tangible global challenge while symbolizing a critical societal relation to nature. It is associated with a variety of negative environmental, social and economic impacts. Thus, marine litter has received considerable attention in politics, science and society, and beyond. There is a broad consensus that: first, land-based sources account for 80 per cent of marine litter worldwide and second, the majority of plastic enters the ocean from a small geographic area. Over half comes from five rapidly growing economies: China, Indonesia, Philippines, Thailand, and Vietnam (Jambeck et al. 2015, Ocean Conservancy 2015, Ellen MacArthur Foundation 2016, Bergmann et al. 2015, UNEP 2016). Thus, South Asia gained fame as the hotspot region for waste inflows. The plastic-intensive consumption patterns and everyday practices have not yet been met with an adequate waste management infrastructure. This triggers international organizations like the World Bank, NGOs like the World Wide Fund for Nature (WWF) and researchers like us to concentrate the work and funding there. Many activities aim at awareness rising for more environmental friendly disposal practices, behavior change in consumption patterns and enhancing the solid waste management infrastructure, e.g. by introducing waste separation and collection as well as secured landfills and treatment plants (UNEP 2016, Ocean Conservancy 2015, WWF 2017, GIZ 2015, UNEP/NOAA 2011). In this light, I choose South Asia and more precisely Vietnam as my case study region. The field study aims to gain in-depth understanding of: first, the waste management infrastructure; second, practices by local communities, the private sector and tourists on plastics and plastic waste handling and third, perceptions of waste and marine litter, respectively, by various actors. By this it lays the foundation for context specific communication measures and awareness raising campaigns and enhances the commitment for and the development of locally adapted measures for waste management improvement and plastic pollution reduction. The text is based on information and impressions I gathered during my first visit in November and December 2017. As a hotspot country, Vietnam is frequently in the press (Die Zeit 2017, WaterNews 2017, Marine Litter News 2017, VnExpress 2017, The Guardian 2015). Vivid pictures with largely plastic waste in Vietnam’s seas, rivers and other water bodies illustrate the negative impacts for the aquatic environment and the tourism industry. Phu Quoc, the largest island in the South of Vietnam, is a striking example. The tourism sector is booming and plastic intensive consumption practices are prevalent while the solid waste management infrastructure is not developing at the same pace. The island with a total area of 589 km² is rich in biodiversity, having both a National Park and a Marine Protected Area. At present, approximately 101.000 permanent residents live in this district of Kien Giang province (Kien Giang year book 2015). Once a calm paradise, the island is now one of the most popular destinations for both local and foreign tourists. In 2017 almost two million tourists visited the island. And the number of tourists is predicted to increase up to five million until 2020. No doubt, litter is an issue. This becomes obvious in the minute I landed on the island. Plastic bags, cups, straws, polystyrol, plastic food packages, coconut shells, construction debris, and electronic waste colorful line the streets, small waterways and coastlines. As listed, littered plastic items directly relate to everyday habits. Plastics are regarded as the most convenient and cheap packaging material, whereas reusable cotton bags are perceived as neither practical nor hygienic. And indeed, the dietary culture is highly plastic-intense: Single bag for single item and double wrapping of goods in grocery shopping, for take-away-food and drinks to-go. Thus, one can easily end up consuming more than ten plastic items for a meal. Since the tap water is not suitable for drinking, plastic bottles are especially popular with tourists while residents use large canisters. The waste production of approximately 160 tons daily already exceeds the solid waste management infrastructure. Hitherto, the island lacks a comprehensive collection system, secured disposal sites and an operating treatment plant, even though the latter is already built. The public collection system, which is operated by the public work management board, collects waste daily in the two lager towns Duong Dong and An Thoi, in Duong Dong’s harbor and river, and along the main roads. Plus, some communes are covered by services every two days. A household pays 20.000 VND monthly for a bin – which is comparable with the price for a coffee –, shops pay up to 100.000 VND and hotels according to quantity. Though, the fee covers only 50 per cent, the rest is financed by state subsidies. For the moment, one open dumpsite is used to dispose the solid waste and partly wastewater from cesspits. It’s set off the main road in a small forest in the surroundings of An Thoi. It has replaced the landfill along the main road between Duong Dong and Cua Can, which has recently reached its capacity. Besides it became a blot on the landscape putting off tourists, government officials and residents equally. Now, a fence serves as screen and the stench wears off. Municipalities not covered by public service independently organize waste disposal and/or leave it to the households. Thus, a formalized and informal disposal system co-exists. Open burning and burying are common practices – regardless whether or not bins exist. Almost every household has a fireplace and a small hole in its backyard. Households along the river and coastline also dispose waste directly into aquatic environment. Waste is not separated. However, sellable items like bottles, cans, paper, and metal are stored separately and are either collected by waste vendors or sold directly to recycling shops. Waste vendors are relatively efficient at extracting high-residual-value plastic materials, like bottles; low-residual-value plastics, like bags, in contrast, are neglected ending up in the islands environment. This pollution not only degrades the environment but also affects the livelihoods of local residents as it poses risks to the living quality and income generation. 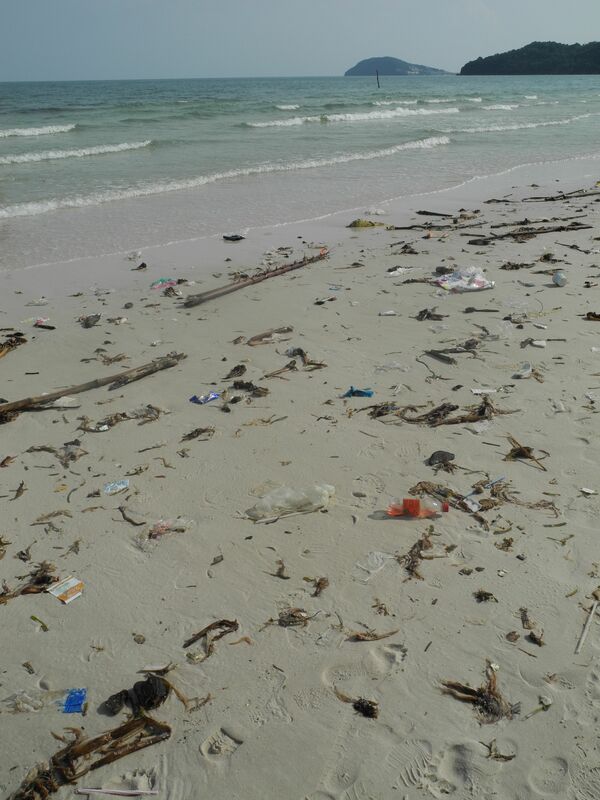 The tourism branch and the local government are concerned over the continuing degradation of the nature-based tourism assets that people travel to Phu Quoc for: Plastics covering the beaches and reefs is not quite the postcard motive. Besides, swimming and diving next to plastic bags, straws, cups, fishing gears, among others, isn’t that inviting. Thus, hotels at the seaside usually employ a beach-cleaning team. The tourism branch and government officials perceive waste – predominantly plastics – as an aesthetic issue leading to high costs and revenue losses. Residents are rather concerned about the smell and the flies coming with the waste in general. So far, ecologic impacts are rarely discussed. Generally speaking there is a wide awareness on the island that one needs to get the grip on the waste management. Thus, the local government invests both in awareness-raising and end-of-pipe solutions. Clean-up events, community meetings, TV broadcasts, and signs inform about correct disposal practices and campaign against littering. And, first schools included proper waste handling in their curricula. Public services are gradually extended to all communities. In addition, there are plans for two more solid waste treatment plants, even though the one already existing has not yet started operation. In contrast, a reduction of the plastic consumption in general is not yet discussed. Overall, the local government faces some challenges to combat the growing waste pollution, marine litter respectively, having both limited resources (financial, personnel, technical) to enhance the waste management infrastructure and limited capabilities to enforce existing law. In addition to the local government, other actors are active, too. The initiative ‘Vietnam clean and green’ organizes monthly clean-ups and awareness events. And the environmental NGO WWF-Vietnam plans to extend their engagement on the island to also address marine litter. To sum up, various actors engage to combat pollution on Phu Quoc. They share in some way or another, the perception that waste management needs to be urgently addressed. And there is a general agreement on possible management strategies, but striving for the best possible means remains to be negotiated. The field study is part of the PhD-Thesis ‘Marine Litter Governance from a multi-scalar Perspective’ by Heide. The study is conducted in cooperation with the WWF-Germany and WWF-Vietnam. Bergmann, M./ L. Gutow/ M. Klages, eds. 2015: Marine anthropogenic litter, Springer: Berlin.